Water level in India’s 91 reservoirs is continuously on decline, especially in the last three months. 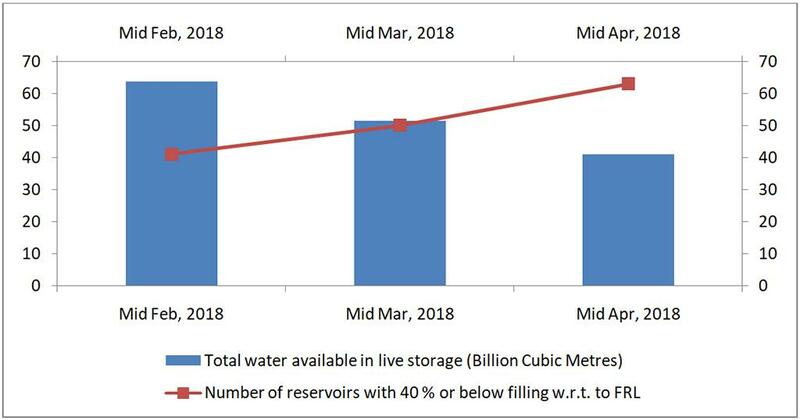 The total live storage capacity has come down from 39 per cent in mid-February to 25 per cent as on April 12, according to the Central Water Commission. Reservoirs in central India saw the biggest drop in water levels to 29 per cent from 43 per cent during the corresponding period in 2017. Similarly, north (from 23 to 20 per cent), east (from 49 to 42 per cent) and west (from 34 to 28 per cent) registered a significant decline. As evident from the table above, only the southern region has seen an increase in live storage availability when compared to corresponding storage of last year. Ironically, the reservoirs in southern region have the lowest live storage (16 per cent) available. The table below shows that eight states have registered a constant decline in storage. The northern state of Himachal Pradesh saw a 35 per cent departure from normal storage between mid-February and mid-April. In the south, Telangana witnessed a 23 per cent departure from normal during these two months. Situation is equally grim Andhra Pradesh, which, currently, has 55 per cent less-than-normal water available in its reservoirs.